my bare cupboard: Apple-pecan cheesecake "
There is a nip in the air , a cool 25°C in the morning but come noontime , it'll another hot day *sigh* I hope winter will come early here , I'm really fed up with you , summer ! I used the last of my cream cheese and one of the few times that it haven't got a chance to develop molds yet hee hee ! Planning on using it for another recipe of cream-cheese filled apple cake but don't have enough apples and eggs on hand . I've been wanting to make this cheesecake for quiet sometime but I always forget to buy pecans . This decadent treat appears during autumn/fall where apples are abundant . But don't worry , you can make this anytime , anywhere and whenever you have the urge . Definitely a nice change to the same old , same old blueberry/cherry/strawberry cheesecake ! * Grease a 6-inch square pan and line the bottom with a parchment paper , grease the parchment as well . * Mix crushed gingersnaps and butter ; press the mixture evenly into the bottom of the pan , put pan in the freezer for 20 minutes . * Preheat oven to 160°C . * Place the cream cheese and sugar in a medium mixing bowl , beat over medium speed until light and smooth . Add in the cream and beat well until well combined ; add in the egg and vanilla , beat until just combined . Pour into the pan and gently drop the pan twice or thrice on the counter top to remove air bubbles . * Combine the ingredients for the topping , mix well ; spoon mixture evenly on top of the cream cheese filling . * Bake for 35-40 minutes . Let cheesecake cool inside the oven for 30 minutes , leaving door slightly ajar . Chill at least 4 hours or overnight before consuming . 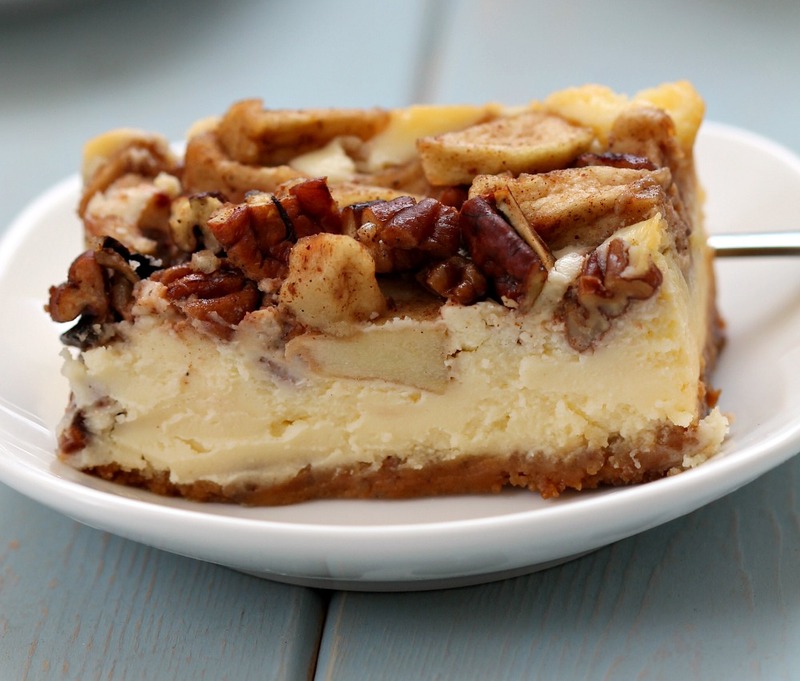 Apple Pecan Cheesecake, oh how festive, Anne!!! I can't say that I have had enough of Summer. This year it didn't seem like we had much of a Summer. This is so perfect for the afternoon tea! anyway-your cheesecake looks great, as always! Wow, what a lovely dessert! I have never tried using apples in a cheesecake before. Looks very yummy! I like all your cheesecake posts! Hey Anne, Anne, back in your space after a looooong time and what greets me is another cheesecake. You really are a cheesecake champion. I got inspired by you over summer and baked mango cheesecake a few times, but it just vanished before I could take a decent photo. 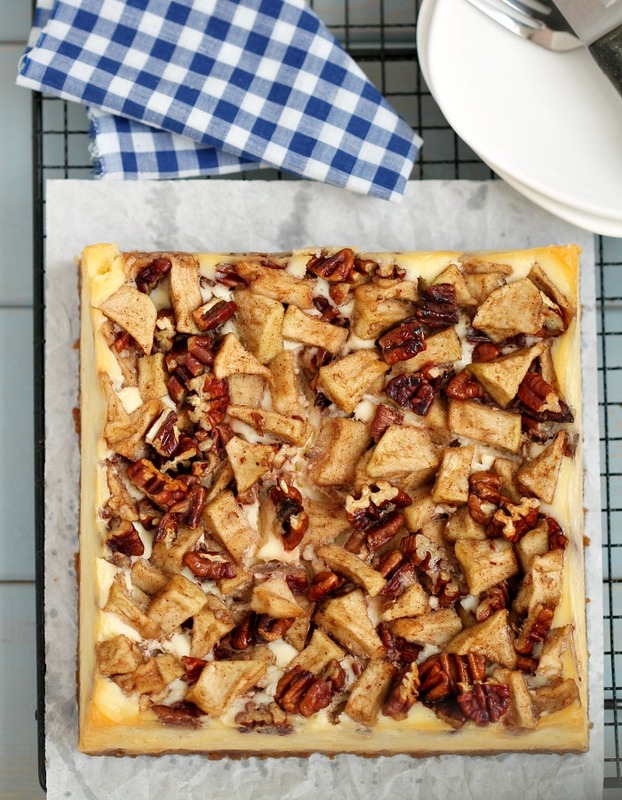 Love the idea of apple and pecan cheesecake, very fall-y like you mention. nvr eaten apple cheesecake before...it's really nice for a change from the usual blueberry ones...but i still enjoy blueberry cheesecake a lot ! That's a very delicious looking slice of cheesecake..yum! Hi Anne! Been some time since i came peeping into your cupboard and i am glad i came by, your cheesecake is beautiful and so tempting! How i wish i could just grab it off the screen! I am craving it right now and I am not going to resist. Let me go in the kitchen and make something. You are really good in doing cheesecake. Whenever I want to bake cheesecake, I will never forget to vist your blog for inspiration. Recently I just baked the lemon mini cheesecake from your blog, for a tea party at home. My guests commented they are so pretty and cute. 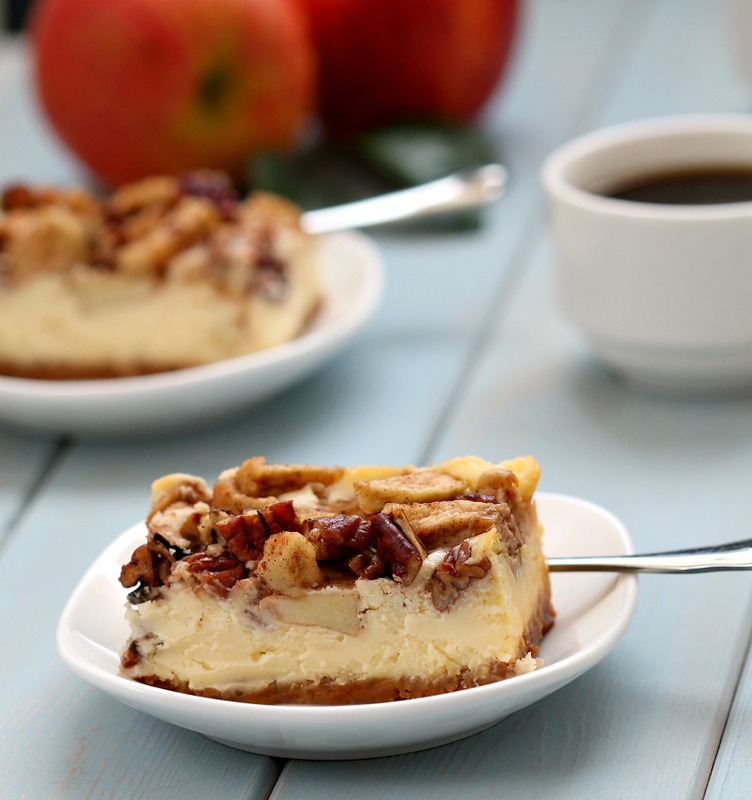 This Apple cheesecake looks good!